The Cannondale Slice delivers more of what real triathletes need to perform at their best in the real world. 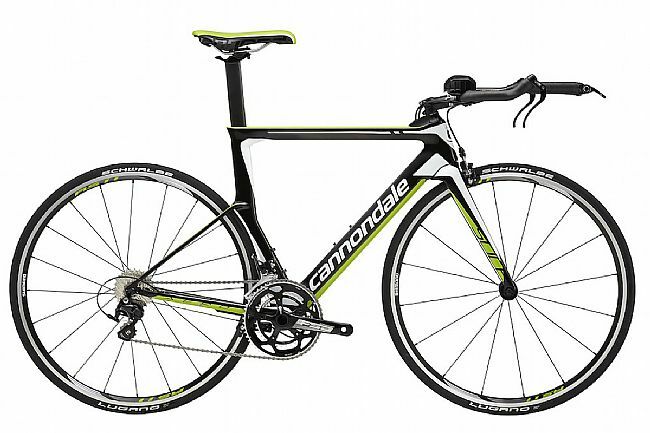 Featuring Cannondale's BallisTec Carbon, the Slice is incredibly light, stiff, and stable. Of course, with a name like Slice, you can be sure that this aero tri bike will have you slicing through the wind on your way to victory. Front Derailleur: Shimano 105 5800, braze-on. Rear Derailleur: Shimano 105 5800 . Cassette: Shimano 105 5800, 11-28. Brakeset: Direct Mount Shimano 105 5800. Handlebar: Cannondale C3 base bar, 31.8 w/ FSA Tri Max Team clip ons. Stem: Cannondale C3, 6061 Alloy, 31.8, 6º. Seatpost: Slice Aero carbon . Manufacturer Warranty: Frame and Fork: Lifetime.